10 tiny fingers and 10 tiny toes. These are definitely one of my favorite types of sessions! I want to assure you that I’ll go out of my way to ensure that your tiny one is warm, comfy, and most importantly, safe throughout the session. These sessions can be held at the place of birth, in studio or in your home. Breathe it in momma, the scent and sight of that little one you can’t get enough of. That little button nose. The adorable way her bottom lip quivers. The way he scrunches his eyebrows. I know the nights are long, as are many of the days. I know you’re tired and all you want is a nap. Let me help you capture some of these moments that will be gone before you know it. Nothing except maybe a nice, long nap after a nice, long bath. 10x10 custom keepsake book AND mini maternity session included! The Watch Me Grow Milestone Plan is something that I am very exited to offer! This is a wonderful way to have the first year of your baby’s life documented in pictures, capturing the changes that happen all too quickly. Most parents choose this plan before the baby is even born, but you can choose to take part until baby is 3 months old. Exclusive products available only for WMG baby plan members, plus much more! 1. Sessions can be held at the hospital, in your home or my studio. However, I find that babies are most comfortable in a familiar setting, as well as any siblings and often the parents. In either case, it needs to be warm, around 76 degrees for babies comfort, so dress yourself in layers. 2. The best thing to do is to contact me well before the baby is born, I suggest contacting me when you’re around 24 weeks. We will then set up a tentative date for the Newborn session related to your due date. The reason why it is a tentative date is because babies like to come on their own schedules, often 2 weeks early or 2 weeks later. 3. When you schedule your newborn session we’ll discuss your expectations including the types of photos you want. If there are any ideas or special props you wish to try, please let me know ahead of time so I can try to plan for them. Any props from home will give your photos more meaning and will make it much more special, such as a special blanket or teddy bear. 4. Once you have delivered the baby or know for certain when baby will be arriving, contact me to finalize the newborn session appointment. Newborn sessions can rescheduled anytime up to 6 weeks old depending on what type of images you like best. If you want baby to lead the posing more naturally than wrapped poses, we can schedule up tp 6 weeks old. 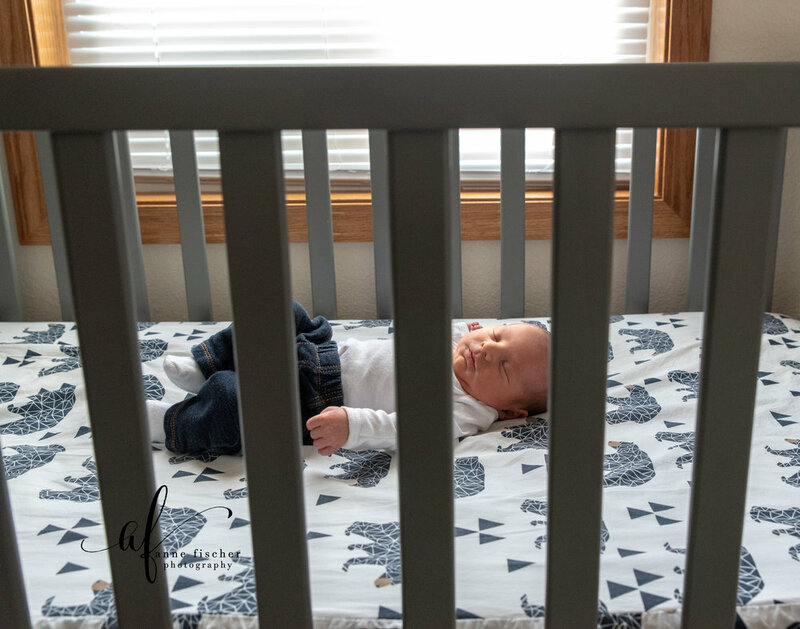 If you prefer those sweet womb-like positions they know so well, it’s best to schedule for when the baby is between 5-14 days old is because they still want to sleep a lot and this allows for easier posing. If you have has a c-section, please let me know, it may be helpful to have an extra set of hands at the session to help you. 5. If your son will be circumcised, we will need to schedule your session no sooner than 5 days after a circumcision. There is no exception to this for his health and comfort. 6. Simple Sessions in the hospital, also known as a Fresh 48, are approximately 1 hour and are less posed, all natural lighting and more storytelling in nature. These are usually scheduled the morning after baby is born so momma has some time to freshen up and hopefully get some sleep. 7. Studio and in-home sessions last 1-2 hours but you should plan on up to 3 hours. A majority of this time in my studio is for switching blankets and props, feeding, changing, rocking, cleaning up and positioning. For this reason, I try to schedule a newborn session about 9 or 10 in the morning when babies tend to be sleepier and light is best. Sessions in your home will be simply posed with baby’s own decor, natural lighting and are more storytelling in nature than studio sessions. They can be scheduled anytime between 9-4. 7. Babies are usually more cooperative during the session with a full tummy. Please try to plan to feed baby at the beginning of your session if we are doing a studio session or just before I arrive, if your session is in your home. I will need time to finish your set up and you can feed while I do this. 8. Try to have baby dressed in something that doesn’t have to be taken off over their heads and is loose around their wrists and ankles so they don’t have elastic red marks on them, such as a sleeper. 9. 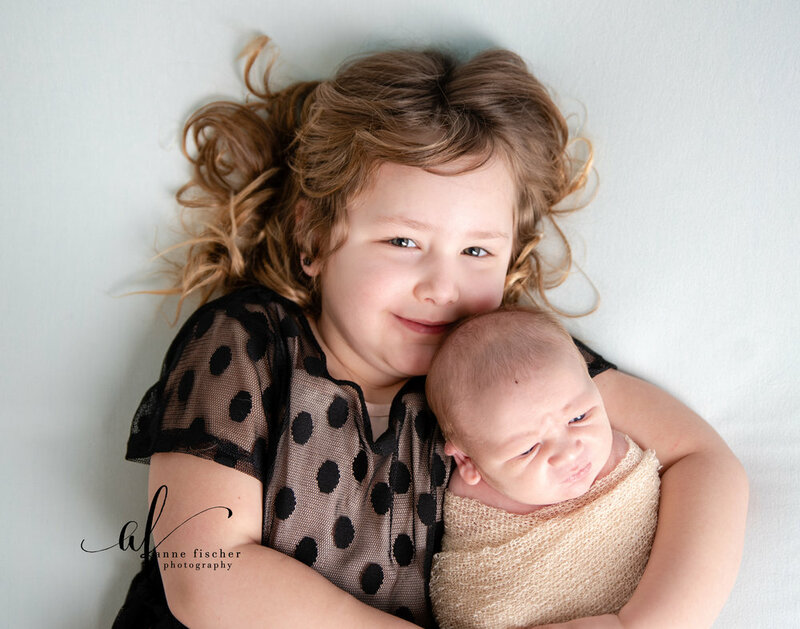 If the parents or siblings are going to be in any of the photos (depending on your package) I suggest that clothing is simple, light and comfortable. Black, cream and white are all good choice, but ultimately it is up to you.